He said he used to solve all his problems in one. But you have to know how to rock. Suppose you’re tired and worried about a problem. Well, then you get to thinking slow and calm. Get it? That’s the ocean rock. you gotta be doing something… and you rock very fast. and get it…well, you just rock over and get it. Yesterday, my sweet aunt visited from British Columbia. While we were getting lunch on the table, she was able to sneak a few minutes of cuddling with Loyal, while rocking in the rocking chair that situated near my kitchen cookstove. Sometimes I forget that homes are often lacking in rocking chairs … as our home is filled with them! We have a minimum of 10 rocking chairs, but I believe there are more than that. Rocking chairs of all shapes and sizes … for little and big children … for moms and dads and for grandparents, especially! I absolutely love to see someone come into our home and find a rocking chair and begin rocking. I smile inside as it is remarkable to see how relaxed a rocking chair can make people feel. We didn’t always have rocking chairs in our home. In fact, when I was in my 20s, I gave away a rocking chair that was my mother’s. My parents had given it to me and I thought I did not have a use for it – can you imagine that? My parents still tease me to this day … how could I throw away a sentimental chair? 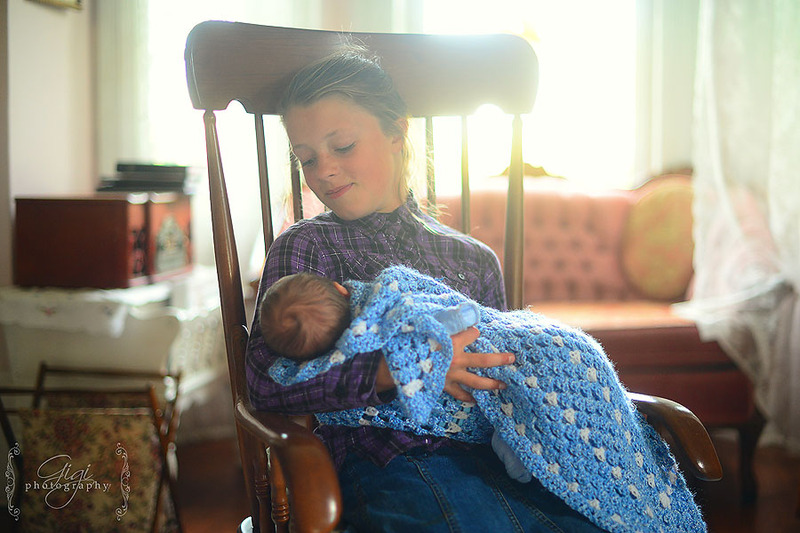 Little did I know I was to have a great need for a rocking chair in our home of many babies! Now, sitting in a rocker, holding a baby or a child, is one of my favorite past times. 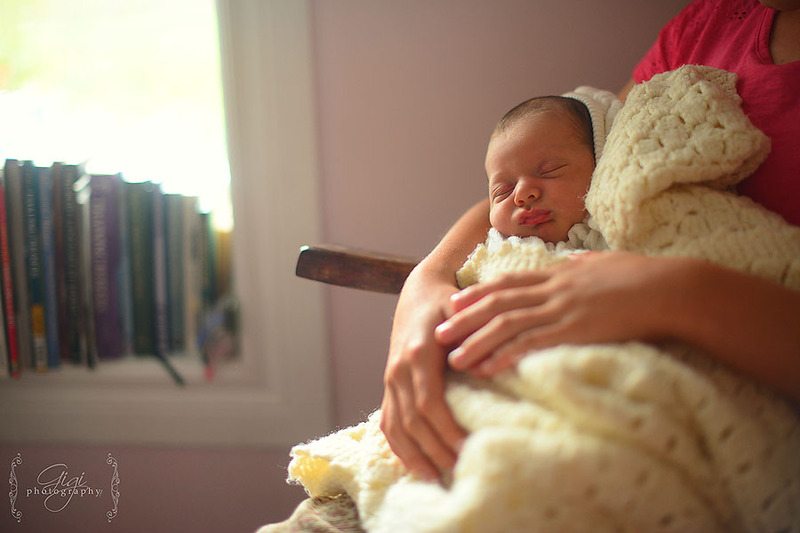 Who knew rocking a baby would be so beneficial for you and the baby?! Studies have proven than a baby’s heart rate slows and the baby is more relaxed and soothed while being held and rocked. It is certainly relaxing. It slows you down, gives you that simple moment in time to breathe and relax, look at your baby and memorized every detail of his face. The health benefits, besides soothing your baby and promoting bonding, include enhancing emotional, social, cognitive and motor development. Do you have a rocking chair in your home? If you don’t, perhaps you should consider finding one – for the simple reason that it is truly good for you! The motions of a rocking chair causes a release of endorphins that elevates your mood and ease tension. Yes, using a rocking chair will help reduce stress! “Rocking helps prevent pain signals from traveling from the back to the brain. The site also claims that rocking can significantly improve pain from arthritis”, as it states here. If you have back pain, you should definitely invest in a rocking chair! There has been some studies showing that a rocking chair will help an energetic young child who has trouble focusing on their school work. The rocking motion allows them to still move, but they are able to focus on their lessons a bit easier … perhaps more school rooms should have rocking chairs available for their students. The motion of a rocking chair also helps with healing from knee surgeries. Even airports are using rocking chairs to help their passengers relax between flights. What a great idea! 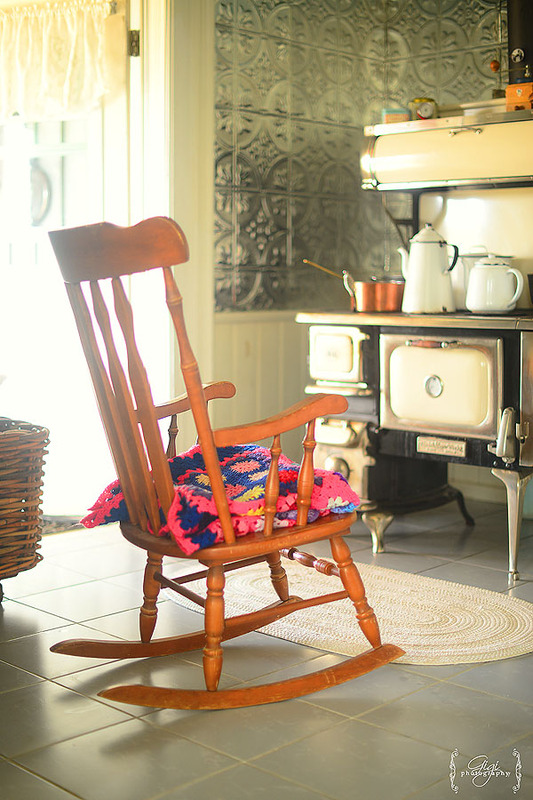 In a world that rushes by and is loaded with ridiculous amounts of stress and anxiety weighs heavy on the minds of many, I think perhaps it’s time for a rocking chair revival in many our homes. Gigi – That’s wonderful, Rebecca! Rebecca – It’s so funny I’m reading this today cause I just bought a fourth rocking chair for my house! 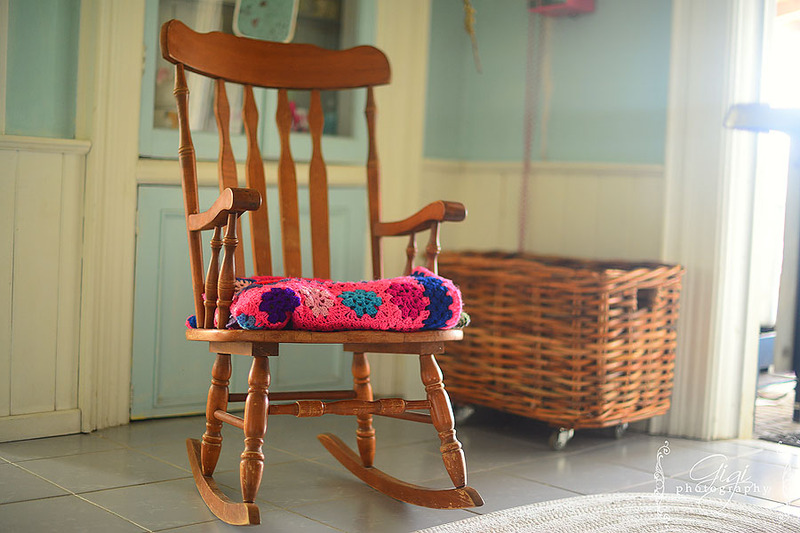 I love old fashioned wood rocking chairs — they look so pretty and I love rocking in them while knitting or reading to my girls. Megan newbury – Not to worry! When you have time 🙂 ps was it here I saw you made elderberry syrup? I cannot find the berries anywhere and would love to make some also! Any hints where i can buy some homemade or where i can get the berries from? Gigi – Katy, so wonderful! I agree – porches need rocking chairs! Megan, check your mail soon – 🙂 I’m so sorry it has been so long! Katy – Oh I completely agree! I love rocking chairs! I love all the facts you shared about them too! I wasn’t aware of all those wonderful benefits! 🙂 My husband gifted me handmade Amish rockers for our new back porch (for my birthday). I absolutely love them! There have been many times of lovely conversation while rocking on those rockers between family and friends! :o) I even have a post not too far back on my blog stating how I believe every porch needs at least one rocking chair…if not more! :) A lovely post and I loved the photos as well! Have a joy-filled week! Gigi – I agree – the gliders are not the same. I’m not sure why? And I have a challenging time finding pillows for them too. I need to make some, I guess, if I can figure it out. Regina – Oh I love rocking chairs. I have a rocking chair my husband gave me, when we were expecting our first daughter. That was almost 23 years ago! Now those glider “rockers” to me they aren’t true rocking chairs. There is something about them that just isn’t right. Anyway, I have a hard time finding back and seat pads for my rocking chair. I might have to figure out how to make one. 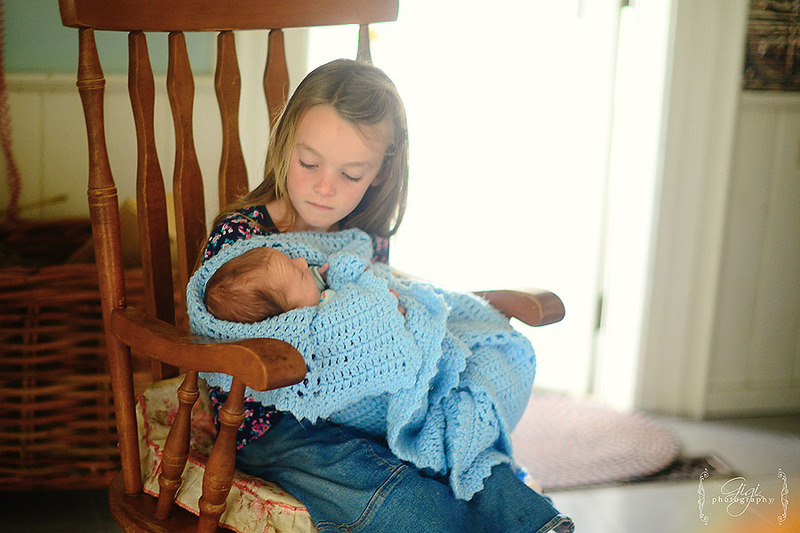 Our Home of Many Blessings – Oh how lovely…we have quite a few rockers as well.iv always had them in my home and just love them.I love rocking sweet babies out on the porch early in the morning before the day has began.